"I pledge to uphold the objects of the Albino Squirrel Preservation Society, to foster compassion and goodwill towards albino squirrels, and to dedicate myself to the protection of all squirrels, especially those that are albino." The Albino Squirrel Preservation Society was created in April of 2001. The club was created in reaction to the dwindling population of albino squirrels found on the UT campus. These beautiful creatures are extremely vulnerable to enemies because of their gleaming white fur. It is also widely known on campus that if you see an albino squirrel, you are guaranteed success on your next test. It became increasingly obvious that these lovable animals needed our help. Though initially we faced ridicule, we were eventually able to get our club off the ground. By the end of our first year, the ASPS had skyrocketed to over 100 members. Eventually it became clear that our mission exceeded the boundaries of the UT campus. 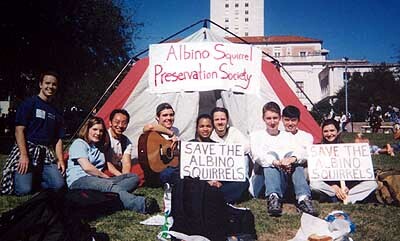 In the Fall of 2002, we began the process of creating a global network of ASPS chapters in the hopes of someday creating a world where albino squirrels can live in freedom and equality. We currently have chapters in the United States, Canada, and England. The ASPS has many activities scheduled for this coming year. These include flyer distribution on the West Mall, socials, and a South Mall Campout each semester to raise awareness of our cause. We also encourage our members to feed and protect any albino squirrels they may encounter. If you are interested in joining, please click HERE (membership is free).